Anyone who has participated in weight training is familiar with muscle soreness that occurs a day or two after exercise. But pain in the neck, shoulders and low back also occurs frequently in those who do not lift weights. If neck, back and shoulder tightness/stiffness are common in both weight lifters and desk jockeys, then what’s the cause and how is it treated? Chronic pain may be due to weakness of the muscles. Research such as JP Lund, et al.’s study in the 1991 Canadian Journal of Physiology and Pharmacology suggest that pain in the low back, neck and shoulders is often due to weakness in the muscles supporting these areas and that the pain is a protective adaptation. Doctors have shown that once the muscles are strengthened, the pain is diminished or disappears. Dr. Thomas E. Dreisinger (“Exercise in the Management of Chronic Back Pain,” in the 2014 Ochsner Journal) specifies that chronic low back pain that’s not “red flag pain” is treatable with strengthening exercises. However, “red flag pain” is unrelenting and constant, interferes with sleep, is accompanied by weakness and/or numbness, and/or occurs with an unanticipated weight loss or gets worse when the patient lies down. These symptoms are a good reason to see a doctor because they might be caused by a tumor, cauda equina syndrome, infection, intervertebral disc prolapse, spinal nerve root impingement or spinal fracture. Acute trauma, typically indicated by a sharp, sudden onset of pain with swelling and redness, that’s sustained while exercising, should be treated by a physician. This article addresses pain due to muscle imbalances and not red flag pain. It’s common knowledge that enhancing strength, flexibility, endurance, and balance improves activities of daily living such as sitting, rising, bending, twisting, lifting, walking, and climbing. Dreisinger states, “only resistance (strength) training has been shown to result in increases in all four of these at the same time.” He also strongly encourages the use of weight machines for careful calibration of exercise progression and the need for periodic tests (clinician based outcomes) measuring the degree of injury/incapacity as the patient heals. 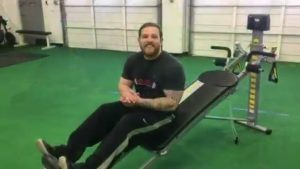 The Total Gym offers a wide variety of options, both compound and simple exercises, to strengthen muscles around the shoulder and support the neck and lower back. Because the machine has a calibrated column and provides full support for the back, it is ideal for therapeutic exercise. The following exercises address benign neck pain due to muscle strain or sprain. Only use resistance after irritability of the nerves has decreased. Lying supine, place a rolled towel under the neck, and press the back of the head into the floor without tucking the chin or flexing the neck. Standing upright, press the chin back into the neck (this can be done against an elastic band as pain permits. Wrap the band behind the neck, holding one end in each hand. Extend the elbows while keeping the neck straight.). Lying supine, lift the head off the floor and nod the head, flexing the neck. Sitting upright, with the shoulders relaxed and fingers pressing into the cervical neck bones, lift the chin up and extend the neck. Note that neck and shoulder pain often occur together, so resistance strength training of muscles that attach to neck and shoulder bones can help both areas. Neck pain can be addressed by strengthening the trapezius, which is also involved with the shoulder because it’s attached to the scapula, acromion and clavicle bones of the shoulder. The shoulder is a ball-and-socket joint; good range of motion is dependent upon keeping the ball in the center of the socket. Or, to use another analogy from Lisa Kerns, MS PT CSCS, the shoulder joint is like a golf ball sitting on a tee. The ball falls off the tee when there are imbalances in the muscles surrounding the joint. A weightlifter who focuses on the chest and neglects the back may end up with shoulder pain because the humerus shifts forward in the joint as tight chest muscles pull it. 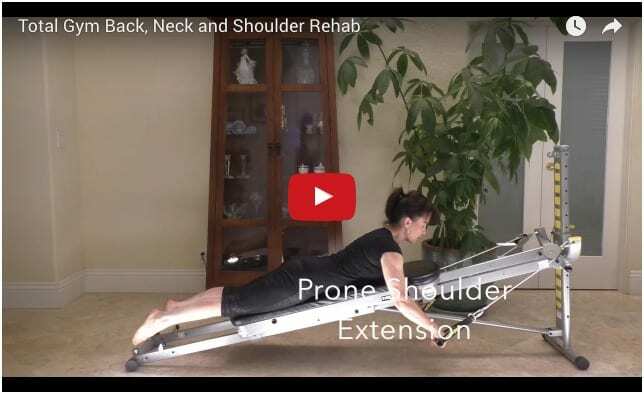 The following exercises help treat neck and shoulder pain by improving the strength and imbalances of muscles involving the scapula and glenohumeral joint. Weightlifters who complain of chronic low back pain may not be spending enough time working on their core. Relying on a weight belt to support the back is not enough. The first line of defense against back pain is a strong core. Balancing the muscles supporting the spine on both the back and front of the body help prevent back pain. Again, be sure that the pain is not accompanied by numbness or weakness in the lower extremities. These symptoms are best assessed by a physician. The following exercises start with no resistance, other than gravity, and gradually get more challenging. Cobra (with modifications and progressions): Lie on the stomach with the hands under the shoulders. Press the arms straight and lift the head and chest off the floor. Hold for five to eight breaths and then lower down. Pilates Swimming: As you gain strength, you can put your arms alongside your body or raise them above your head as you lift the upper torso away from the floor. Squeeze the glutes and press the hipbones into the floor. Raise the opposite arm and legs, alternating sides in a swimming motion. Keep the center of the body still with the legs slightly apart. Progress this movement by using the Total Gym and performing the swimmer against resistance: Lie facedown with your head toward the column and the cable handles in each hand. As you extend the back, pull the handles out to shoulder-height in a T shape. Roll-Up: Insert the squat stand or toe bar into the end of the Total Gym and unhook the pulley cable. Lie face-up with your legs straight, your arms above your head and your feet on the squat stand. The higher the incline, the easier the roll-up. As you roll up and roll back, concentrate on using the abdominals to round the spine. You can reach your arms out over the toes for an added stretch. Crunch: Lie face-up on the Total Gym with your head toward the column and your knees bent. Without holding the cables, the lower the glideboard, the harder it is to crunch. If you hold the cable handles by your hips and do a crunch, increasing the incline will add resistance because then you’ll be moving your body weight up and down the guiderails. Oblique Pullover Crunch on the Total Gym: Lie face-up with your head toward the column and the cables in each hand over your head. As you crunch forward, pull both arms down and across the body. Inverted Front Raise with Crunch: Lie face-up with knees bent, your feet toward the column and cables in each hand by your hips. Perform a crunch and then raise your arms to shoulder-height, either one arm at a time or both at the same time.